NURSERY ABSOLUTE AUCTION! BUSINESS SOLD SO EVERYTHING MUST GO! EVERYTHING SELLS TO THE HIGHEST BIDDER! 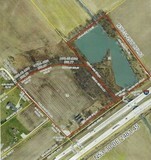 Jefferson Twp: 22 Combined Acres-A Sportsman's Paradise with woodland, pasture, and large pond.